Let me start with the latest news and that is that Renan Brito has transferred to Internacional as written on the official Valencia cf website. This was known for weeks basically and the contract was rescinded some time ago as you can see in the transfers page. Renan Brito spend the last season on loan at Internacional where he started the majority of the games, he goes to Internacional as a free agent, although Valencia CF essentially reached an agreement with Internacional to forgive the 1 million we owed them for Renan. Next up is the news that Aaron Niguez has rescinded his contract with Valencia CF as well and was snapped up by Almeria as a free agent. 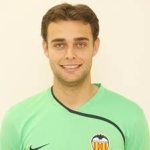 Aaron was once regarded as a great talent, but injuries put a stop on his career in Valencia CF and was loaned out to many teams: Recreativo Huelva, Celta Vigo, Glasgow RangerS, Iraklis, and Xerez. I've already written about Isco and have it in the transfers page, but in case you haven't noticed his transfer to Malaga has been officially announced and he was even presented as a new Malaga player. Last but not least is that the training sessions are going great, the players are enthusiastic and practicing hard, the medical exams have finished and a special report on each player individually is made about eating regime and training regime. Unai Emery has also made the training sessions open to public for just the first 15 minutes to the public and media, in a bit to remove distractions.